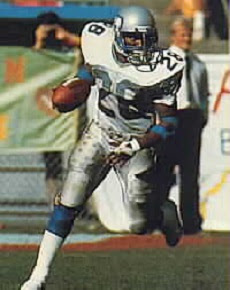 Warner broke 42 school rushing records and was a key player on the 1982 national championship squad as he rushed for 3398 yards at Penn State. The Seahawks took him in the first round of the 1983 NFL draft (third overall) with the expectation that he would add speed and pass receiving ability to the backfield. Seahawks went 9-7 to finish second in the AFC West and qualify for a Wild Card playoff spot. Won AFC Wild Card playoff over Denver Broncos (31-7) and Divisional playoff over Miami Dolphins (27-20). Lost AFC Championship to Los Angeles Raiders (30-14). Warner suffered a knee injury in the opening game of the 1984 season that cost him the remainder of the year, and while he came back in ’85 to rush for 1094 yards and catch 47 passes, he wore down noticeably in the second half of the season. In 1986 he regained form as he led the AFC in rushing with 1481 yards and followed up with 985 in the strike-interrupted ’87 season. Warner was selected to the Pro Bowl following both of those seasons. However, he suffered an ankle injury in the 1987 season finale that required surgery and, while he ran for 1025 yards in ’88, was no longer as consistent as in his peak years. Following a 631-yard season in 1989, Warner joined the Rams as a free agent but ran the ball just 49 times for 139 yards in his last year. Overall, he rushed for 6844 yards (6705 with the Seahawks, which made him the franchise career rushing leader at the time) and caught 193 passes for 1467 more yards, scoring a total of 63 touchdowns. Warner was selected to the Pro Bowl on three occasions.